Of biological and natural origin, the formula of Fort� Bio Articulations contributes to the joint wellbeing thanks to the presence of harpagophytum. 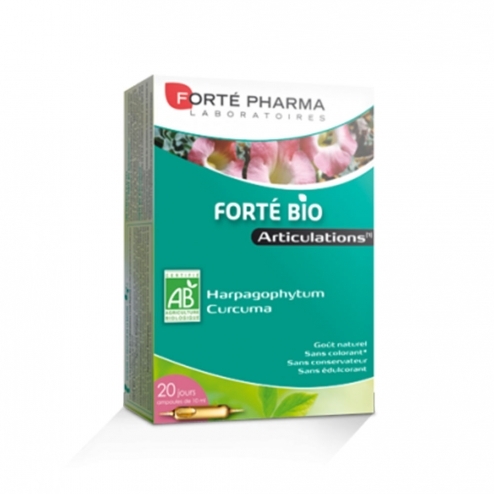 The Fort� Bio Articulations formula contains an association of plant and biological active ingredients. The harpagophytum, also known as the Devil's Claw, is a plant of reference in the articular field: it promotes flexibility and joint comfort (1). Turmeric has been used in Asia for thousands of years to complete this formula. 1 ampoule per day to drink diluted in a glass of water. Shake the ampoule before use because a slight deposit, due to the presence of plants in the product, may appear. Ingredients: Purified water, Aqueous extract of Organic Harpagophytum (4500 mg), Organic Agave Syrup, Organic Turmeric Extract (1000 mg), Organic Lemon Juice Concentrate, Organic Fruit Organic Fruit Flavor, Essential Organic Lemon Oil . Comply with the usage tips. Not recommended for pregnant or breastfeeding women and children under 12 without medical advice.